On November 1, 2018 Donna Decker received the Wayne County Community Foundation’s 2018 Ben Franklin Community Service Award. 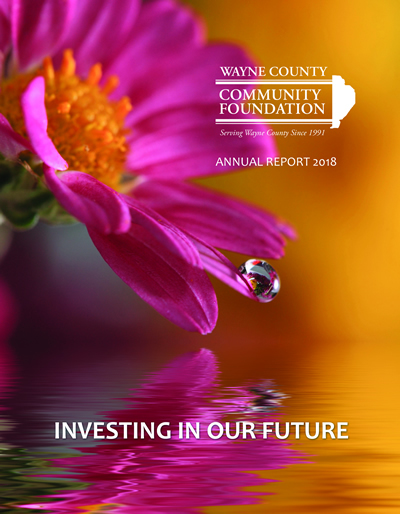 The Wayne County Community Foundation Board of Directions has selected Donna Decker with its highest recognition, the 2018, “Ben Franklin Award for Community Service.” Donna Decker.jpgThe award commemorating one of Nation’s “Foundation Fathers… Benjamin Franklin” is accompanied by a grant of $1000 from the Foundation’s Ben Franklin Fund. This gift will be given to a charity of Mrs. Decker’s choosing. The selection recognizes Donna’s years of service to her community and her profession. The Devereux Advanced Behavioral Health organization recently received a grant the Wayne County Community Foundation to support the acquisition of materials for their Children’s Behavioral Health Rehabilitation Services program and Rapid Response Teams. Recently, the Wayne County Community Foundation and its “First Responders Fund” awarded a grant to the Honesdale Fire Department. The grant will be used to purchase a portable foam extinguisher system. The unit will be used on the Department’s rescue truck and will be especially efficient in controlling car fires with foam. Pictured L. to R. Scot Floyd, HFD, and Jane Varcoe, WCCF Grants Committee. The Wayne County Community Foundation recently presented an award to the Hamlin Rotary in support its “Rotary Safety Fair for Kids.” The project gives away free bicycle helmets, and personal floatation devices and other safety items. It is a free event to children and families. The event will be held on September 22, 2018 from 10am to 1pm at the Evergreen Elementary School in Hamlin. The project is funded from the Yablon Foundation Fund in association with the Community Foundation. Shown in picture L. to R: John Carmody, WCCF Grants Committee Chairman; Tatiana Black and MaryEllen Bentler, Hamlin Rotary and Jane Varcoe, WCCF Grants Committee. On Friday, August 3rd, the Wayne County Community Foundation held its lst “Day of Giving.” The event was held from 2-7 pm at the Cooperage in Honesdale and “showcased” eleven non-profit agencies servicing the citizens of Wayne County. The following organizations participated: Wayne County YMCA; Wayne County Historical Society; Wayne County Arts Alliance; Wayne County Heroin Prevention Task Force; The Cooperage Project; SEEDS of Wayne County; Dessin Animal Shelter; Habitat for Humanity; Wayne County Library Alliance; Victims Intervention and Lacawac Sanctuary. The Wayne County Community Foundation recently presented a Grant Award to Lackawanna College, Lake Regions Center.